Five of San Diego’s business and community leaders — and one “unsung hero” — were recognized on Thursday at LEAD San Diego’s 14th Annual Visionary Awards. More than 800 attended the awards ceremony, which recognizes extraordinary contributions to the San Diego region, at the Hilton San Diego Bayfront. Jessie J. Knight Jr., retired chairman of San Diego Gas & Electric, received the Neil Morgan Memorial Award for Lifetime Achievement. Morgan was the long-time editor of the the old San Diego Tribune. Marilyn Sawyer, a long-time community leader currently involved with Scripps Research Institute, was named the LEAD Graduate of the Year. Mark Cafferty, president and CEO of the San Diego Regional Economic Development Corp., received the Ronald Kendrick Memorial Award for Regional Collaboration. 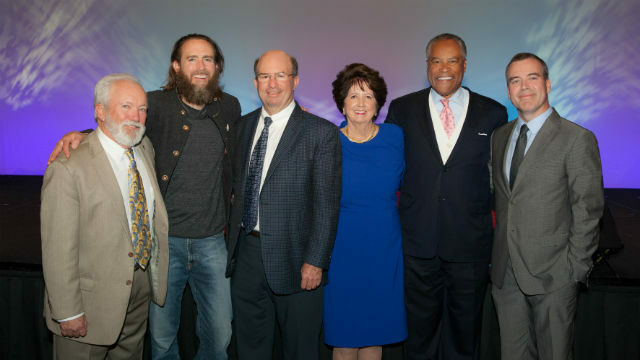 Greg Koch, CEO and co-founder of Stone Brewing, took the Economic Opportunity Award for helping make San Diego the craft beer capital of the world. Stephen B. Williams, managing principal at the real estate investment and services firm SENTRE, received the Charles Nathanson Memorial Ward for Cross-Border Region-Building. The “unsung hero” is Patrick Russell, a volunteer for the San Diego Veterans Treatment Court, which helps veterans suffering from post-traumatic stress syndrome avoid jail time for criminal charges. He developed a formal program to find and train mentors to help veterans. LEAD San Diego provides education and dialogue on issues of critical regional importance to help community leaders become more informed, active participants in the San Diego-Baja region.